DA Form 4017 or the "Request For Personnel Action - Nonappropriated Fund Instrumentality" is a Department of the Army-issued form used by and within the United States Military. The form - often incorrectly referred to as the DD form 4017 - was last revised on April 1, 2010. 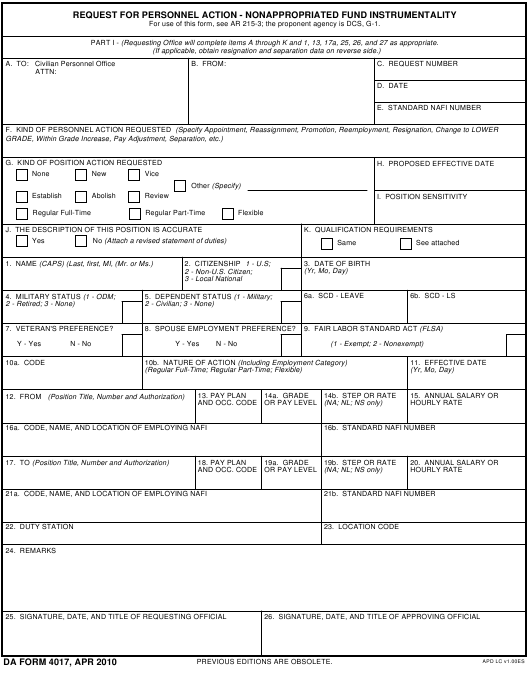 Download an up-to-date fillable DA Form 4017 down below in PDF-format or look it up on the Army Publishing Directorate website. For use of this form, see AR 215-3; the proponent agency is DCS, G-1. PART I - (Requesting Office will complete items A through K and 1, 13, 17a, 25, 26, and 27 as appropriate.